Increase Space by Up to 75%! A Lean-Lift, or Vertical Lift, is a automated storage machine that can increase space by up to 75%! But how? A vertical storage unit can make use of valuable space much better than traditional horizontal storage units. A custom made Lean-Lift can be assembled to fit your specific area to perfectly utilizes the space available. The automotive industry has been using Lean-Lifts because they are able to add more services bays, retail displays, new offices, or simply eliminate off-site storage and clutter. 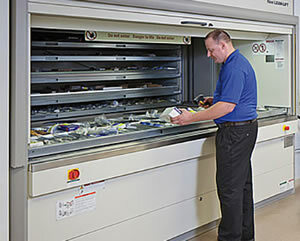 Not only is a Lean-Lift a high tech storage system but it’s also a sophisticated inventory control system which can be integrated with an existing data management system. The many benefits are: a faster installation, faster integration time, dramatically increase productivity, and a constant inventory monitoring system with less error than ordinary inventory processes tend to yield. 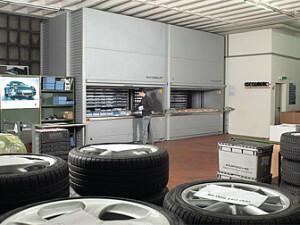 Mercedes-Benz is using the Lean-Lift to keep auto parts organized and easily assessable. The service technicians can retrieve their stock parts with just a push of a button; no more reaching, climbing stairs and endless searches. Their customers appreciate the quick ordering process and short wait times. 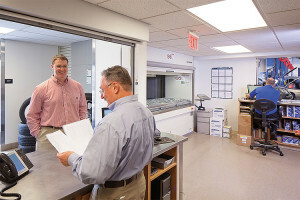 Their facility is fresh, modern, and officiant; which their customers have come to expect from the Mercedes-Benz brand. What can be stored on Lean-Lifts? For our A1 Install service department (relocation and installation of office cubicles and material handling equipment, and shelving) call 801-456-9950.